Remember last month when the newly emerging Epimedium x perralchicum 'Frohnleiten' was eaten to the ground by some herbivore (probably a rabbit)? Epimedium x perralchicum 'Frohnleiten' has bounced back and looks great as usual. Here it is nestled alongside a 'Chicago Lustre' arrowwood viburnum (Viburnum dentatum) and a boxwood. I didn't see nearly as many flowers this year (presumably the flower stems emerged early, got nibbled and didn't bounce back), but the foliage looks good as usual. I don't think the Epimedium has spread much this year though. Like I said before, it's been a slooooow moving groundcover in my experience. That could be good if you have a small garden or just a small space to cover. But if you're looking to cover a lot of ground, you might need to look elsewhere (like to Fragaria virginiana, the wild strawberry). Don't get too excited. This is not the spring beauty you've been looking for. 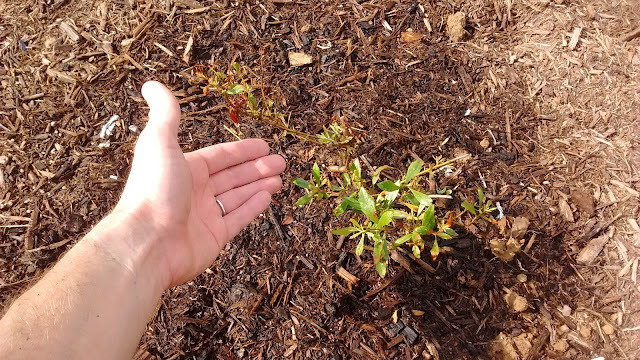 I'll admit it -- I was kind of excited when I saw what looked like a new white wildflower pop up a couple places on the property this spring - one clump in a garden bed beneath a crape myrtle, the other in a weedy patch of lawn next to the back sidewalk. I tried doing some Internet research and tentatively decided it might be spring beauty (Claytonia virginica), a native wildflower in Tennessee and throughout much of eastern North America. But something was bugging me about this plant ID. I took a closer look at my photos and compared them to those online. The pictures of spring beauty that I found online all show a five-petaled flower, often with pink anthers held far above the surface of the flower. 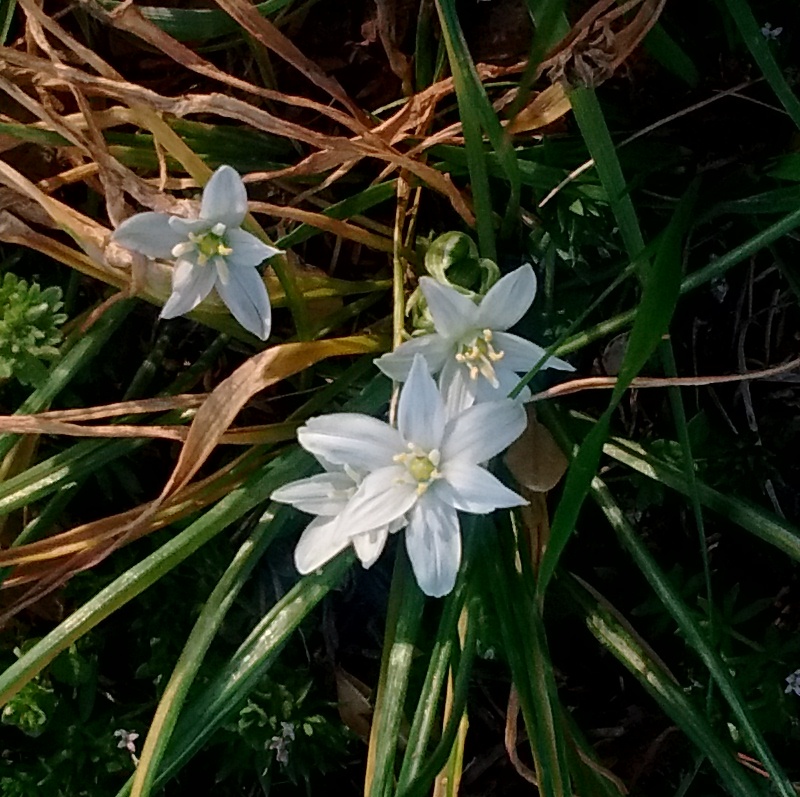 So unfortunately it looks like I have star of Bethlehem (Orthinogalum umbellatum). And although it's charming, it also has a (contested) reputation for behaving invasively. It may also be quite toxic. So...looks like a shovel-pruning is in the forecast. Blue mistflower (Conoclinium coelestinium). Last year, this started as just a tiny quart-size plant. This year, it's on the march! 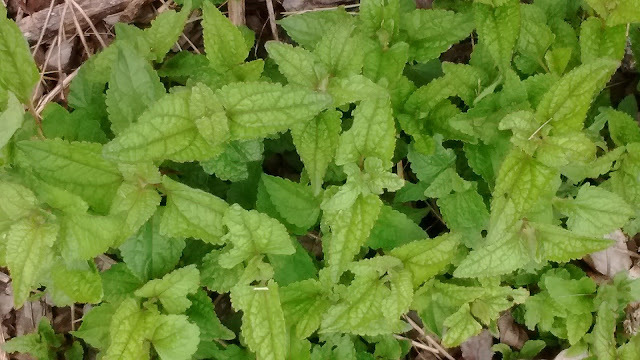 As with other fast-spreading yet herbaceous perennials (e.g., mountain mint), I'm not quite sure about the best way to use blue mistflower (Conoclinium coelestinum) in my garden. On the bright side, as I wrote last November, it has a nice long autumn bloom season with flowers that attract pollinators. On the other hand, as Tammy and Jason both pointed out last year, blue mistflower likes moisture. Although it's planted in heavy clay that gets sodden in winter and early spring, the area also bakes in summer. 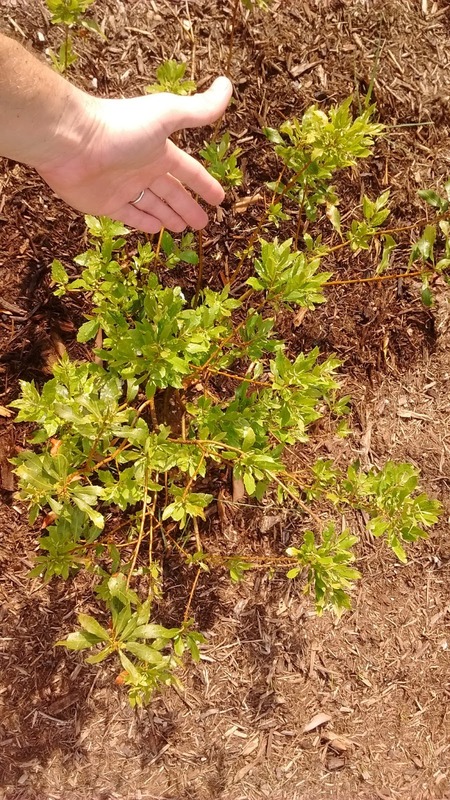 Of the three clumps I had growing last year, it looks like only one clump (the healthiest and strongest) came back this year. 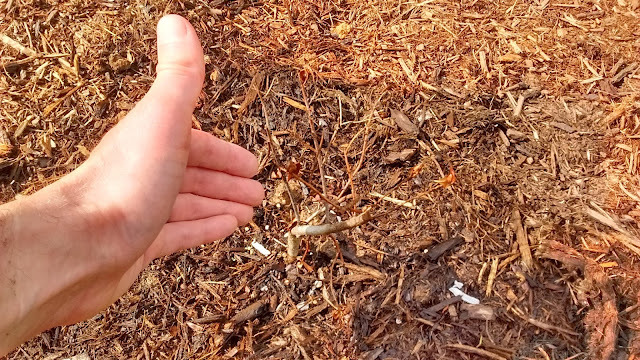 That surviving clump has expanded dramatically - from a 3.5-inch pot to probably close to 4 square feet in about 18 months. I recognize that I kvetched in a recent post about some groundcovers - Epimediums and partridge berry - spreading too slowly. How can I turn around and complain about a groundcover spreading too fast? Aren't groundcovers supposed to cover ground. But as with many things in life, I think there is an ideal happy medium here. I don't want a 'groundcover' that pokes along, only extending its coverage by a couple of inches per year. But I also don't necessarily want a groundcover that races across the property, smothering small buildings in a single season. I'm much more leery of aggressive plants if they're exotic. I don't want to be responsible for unleashing havoc on the local ecosystem. It's one of the reasons why I gave plants like blue star creeper, creeping raspberry, sweet woodruff and Ajuga the heave-ho. 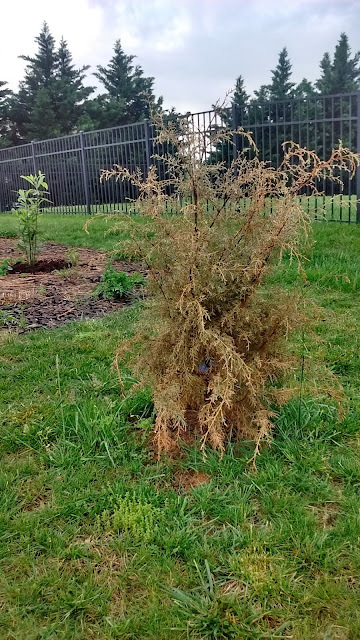 I'm much more willing to tolerate aggressive plants if they're native and/or easy to remove. For example, wild strawberry (Fragaria virginiana) spreads pretty darn fast, but (a) it seems to spread only via above-ground stolons (so I can at least keep track of its spread versus those plants that extend their territory via underground rhizomes), and (b) it seems very easy (so far) to uproot any clumps that grow where they are not wanted. When the blue mistflower gets a little taller, I plan to go out after a rain and see how hard it is to pull out some stems along the edges of the clump. Basically, I want to see how much of a struggle it will be to keep this in bounds. If I do let it stay and it romps through the back garden, I envision a lot of late winter or early spring maintenance. 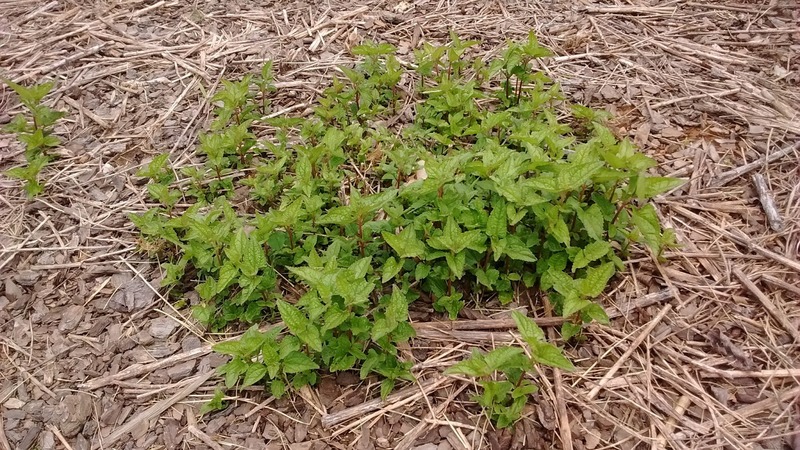 It's not such a big deal chopping down stems on a few clumps of rose mallow (Hibiscus moscheutos), but I think it's another matter entirely to find a way to deal with 100 square feet of a tough-stemmed herbaceous and rhizomatous perennial. 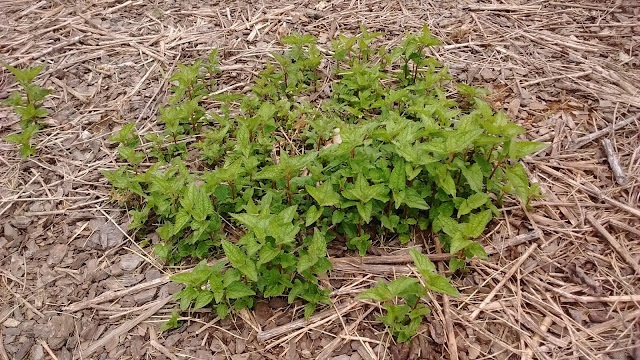 For anyone who has a large stand of blue mistflower or any other aggressive perennial (e.g., one of the rhizomatous goldenrods, a spreading Monarda or a mountain mint), how do you handle winter clean up of large swaths of dead stems. Do you cut back by hand with a bypass pruner or shears? Do you use a mower? Then there's the issue of blue mistflower being deciduous/herbaceous. 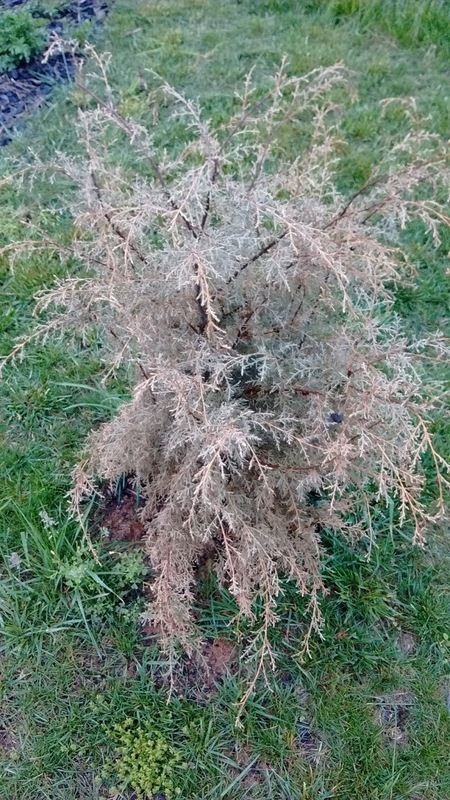 It dies back in winter and didn't make an appearance this year until late March / early April. If it covers a lot of ground in spring, summer and fall, that means a lot of bare ground from late autumn to early spring. 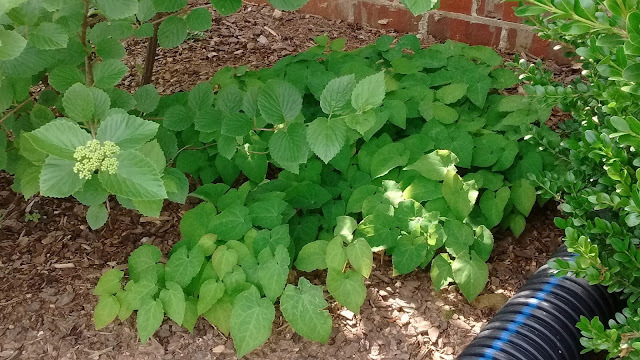 I worry about weeds getting a toehold in that bare dirt. That's why I've gravitated toward low-growing evergreens ('Biokovo' geranium, wild strawberry, golden groundsel, Robin's plantain, etc.) in my search for ideal groundcovers. Anyway, blue mistflower is still in the garden for now. If you grow this plant - or something similar in habit - I'd love to hear how you integrate it into your garden to enjoy its assets without having it become a maintenance nightmare.